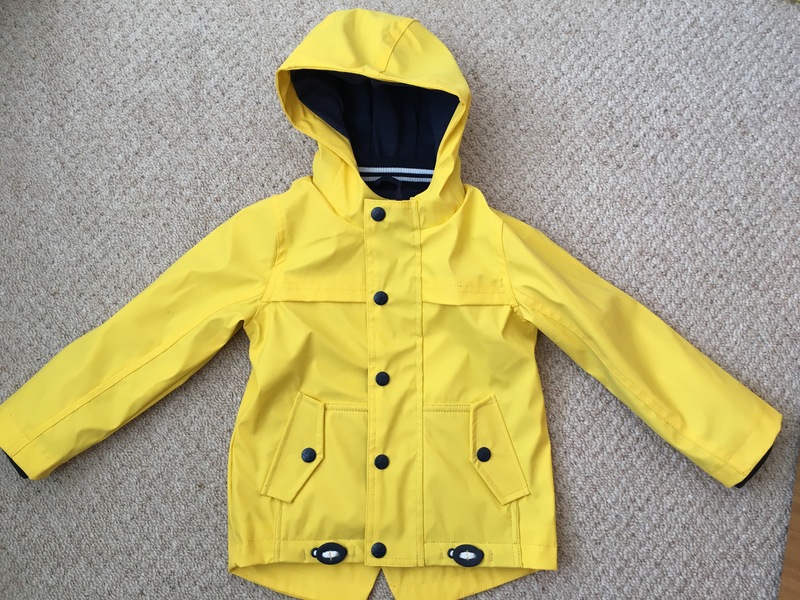 I love looking at and reading about what other people are dressing their kids in, so I thought that following a few too many kids clothes purchases I would write a little blog about them. 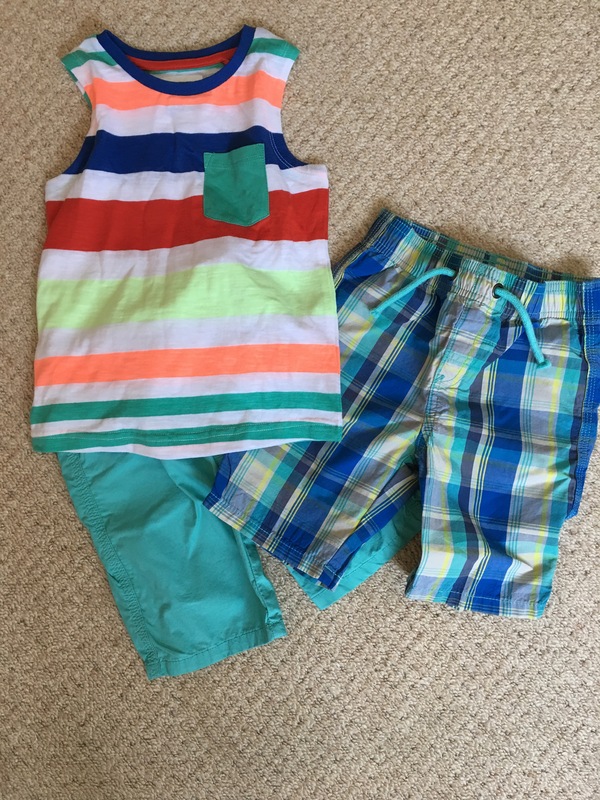 With the warmer weather hitting and us getting round to booking a summer holiday I decided the boys needed lots of summer clothes. The first place I went to for clothes was Zara. I have always found their kids clothes to look good, wash really well and be great value for money. I went into store in Southampton first but they don’t have a great baby selection so did an online shop instead. For Woody I got a pair of orange shorts and 3 tshirts all in size 2-3years. The tshirts are brilliant, fun prints and make a nice difference to the plain ones he usually wears. Be warned about the shorts though- I managed to dye a lot of Arlo’s nice white vests pink by having them all in the same wash (mum fail!!). 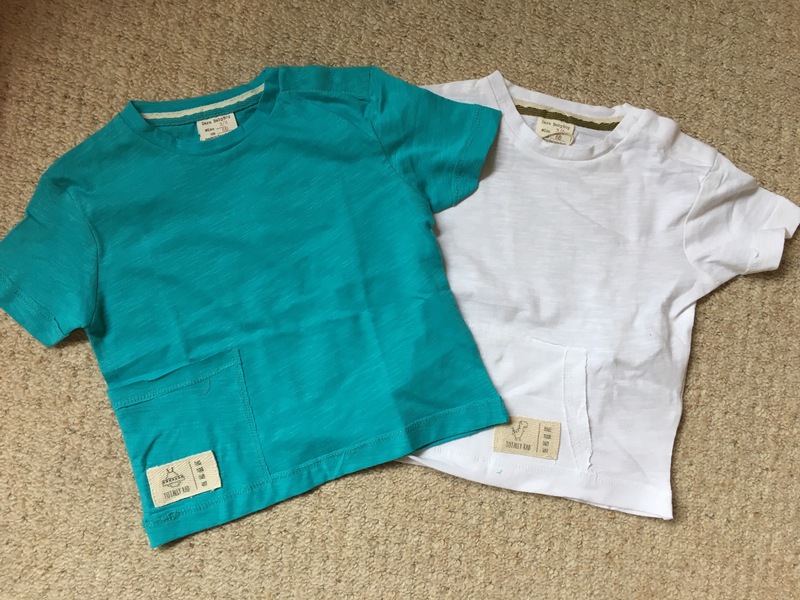 For Arlo I got a couple of plain tshirts to wear under dungarees and with leggings. I got these in 3-6 months hoping they would fit now, but they are massive! Hopefully he will get use out of them at some point this summer. I felt everything was good value, with all the tshirts costing £3.99 and the shorts £14.99. The second purchases from Jojo Maman Bebe were gifts from my mum to the boys. They are matching outfits, but not obviously! 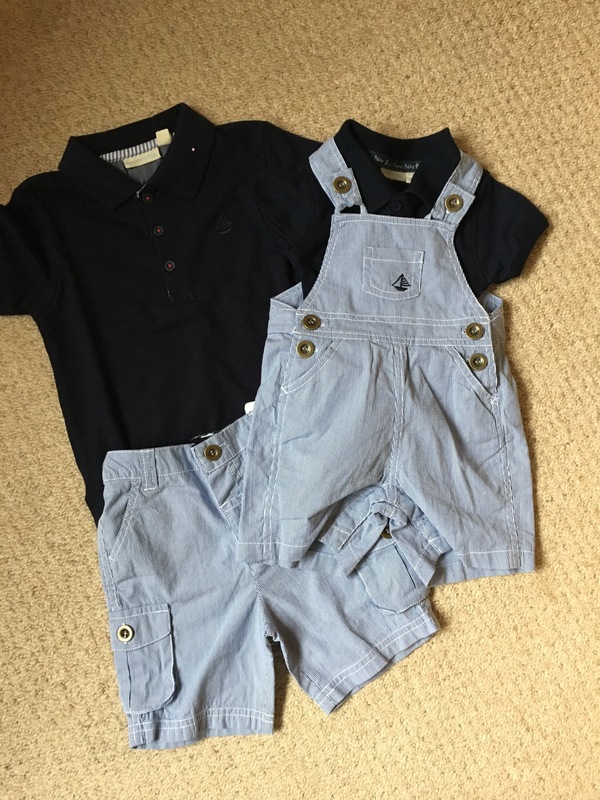 Woody got blue stripey shorts with a navy polo (size2-3) and Arlo got blue stripey dungarees with a navy polo which has poppers over the nappy like a vest (size3-6 months). I think they look so cute in these and are perfect for being a bit smarter if we are going somewhere at a weekend. 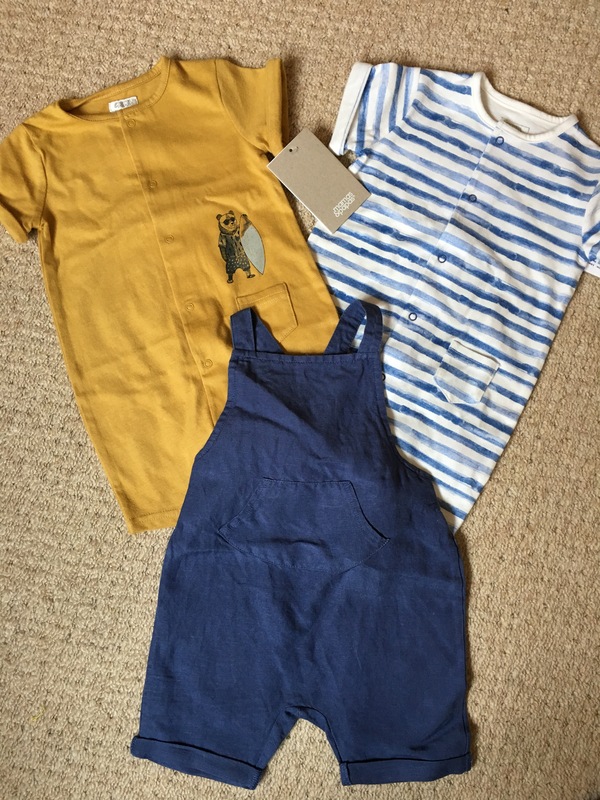 I popped into Mamas and Papas recently for a browse and found some lovely things in a 3for2 deal so got a few bits for Arlo. When Woody was a baby I found the clothes in here were a bit too smart for everyday use and quite expensive. After my recent visit though I thought they had some lovely things- nice colours and prints and at affordable prices (especially on discount weekends or in 3for2 deals!). 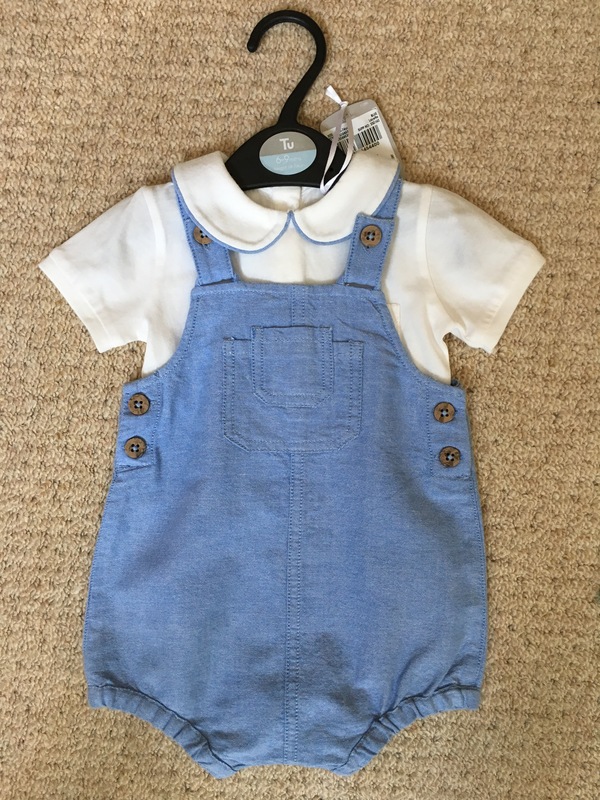 I got two short romper outfits and a pair of cute navy linen dungarees. All in size 3-6 months so he can wear it now. Both of the rompers were £10 and the dungarees slightly more. The recent 25% off TU at sainsburys was like a magnet to me!! I have found sainsburys boys clothes to be brilliant, especially when buying things to wear to nursery. 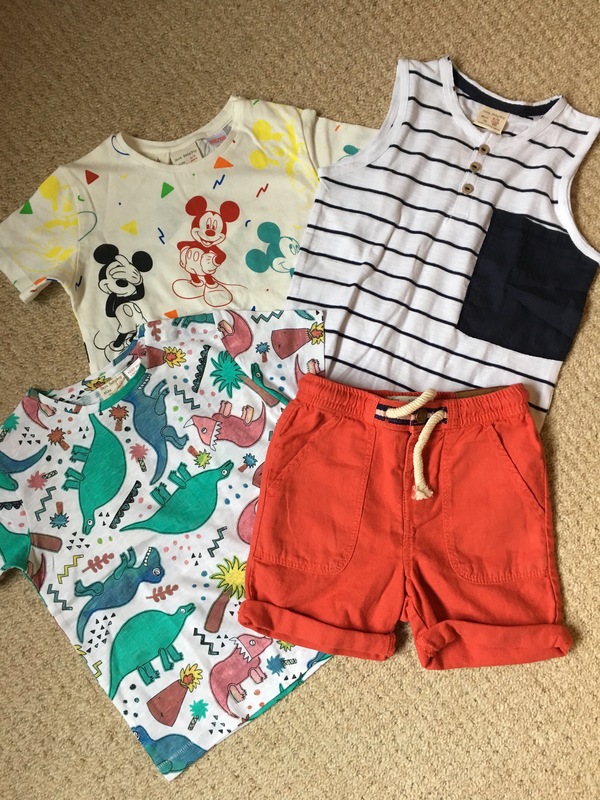 I popped in to see if there were any shorts for Woody for nursery and came out with four pairs and a tshirt and a cute outfit for Arlo. The shorts are light weight cotton and so should be quite cool on the warm days. They came in a two-pack and should have been £8 – four pairs for £12 you can’t go wrong!! The little vest was £2.50 (could resist the retro design!!). All in size 2-3 and there is room for growth. Arlo’s little outfit was an unnecessary purchase- but at £7.50 I couldn’t resist! I got this in size 6-9months as didn’t think we would get much use out of 3-6month, so will hopefully fit when we go on holiday in September. I saw this coat a little while ago and planned to purchase when M&S did a 20% off weekend (always worth waiting for when something isn’t urgent!!). It should have been £24 but got it for £19.20. Woody has a similar blue coat which was handed down to him and although is size 18-24 months it has lasted forever so I’m hoping for the same from this size 2-3 one. It’s nice and waterproof and the super bright colour means we won’t loose him when he is wearing it!! My final purchase for the summer (well for now) was sun hats. I had seen some on Instagram that I liked but were a bit of an investment. So I had a look around the high street for some and couldn’t find any I liked so it was back to Instagram. I got these from Little Hotdog Watson and they were £24.99 each. 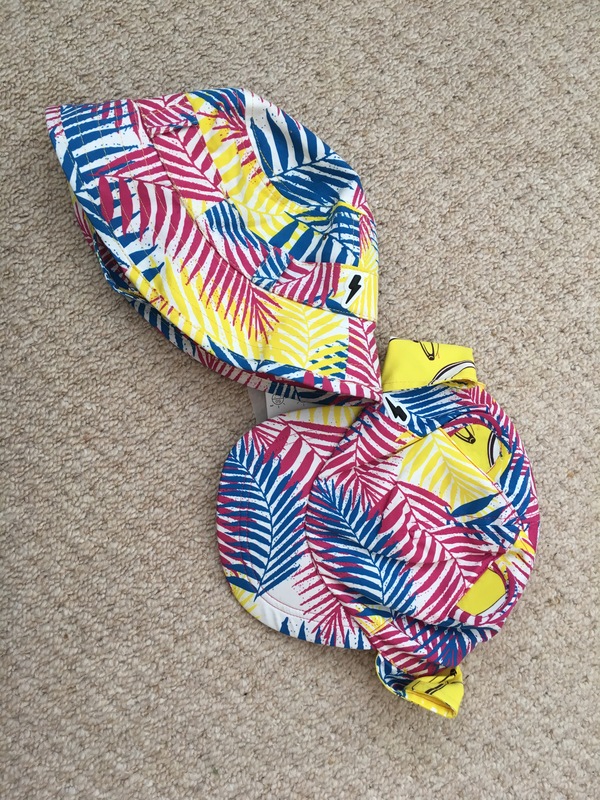 They are super protective from the sun and use some magic fabric which stops the kids from overheating when in the sun- very appealing for my hot boys!! I got Arlo ‘The Adventurer’ in Tropical Leaf in size 6-12 months (it has to last for our holiday in September!) and I got Woody ‘The Cub’ (which is a cap with cute little bear ears and a neck protector) in Tropical Leaf too! I originally ordered him size 18-36 months but it was too small so got bit swoped for size 3-5years! As with most of the lovely Instagram companies I’ve encountered, the parcels comes wrapped beautifully and this one came with some balloons and a nice hand written note- I love all these extra touches from small businesses!! So they are pretty set up for the summer with some really nice little clothes in my opinion!!! Now just need to curb the addiction to buying more for them!! !